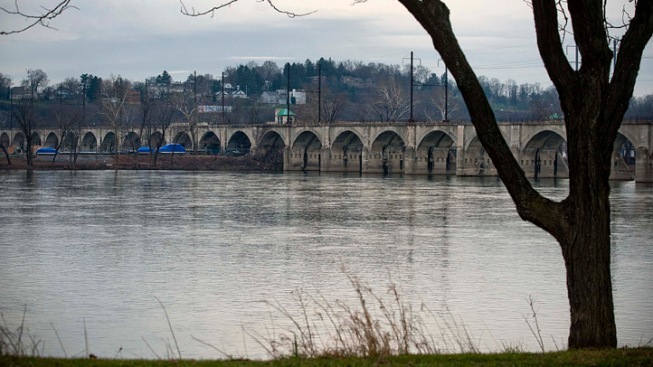 A bridge crosses the Susquehanna River in Harrisburg, Pennsylvania. A naked man was arrested in Pennsylvania Sunday after driving a stolen vehicle into the Susquehanna River, bringing an end to a high-speed car chase. At 10:15 a.m, Springettsbury Township Police received reports of an erratic driver in a green van with a missing tire. Five squad cars were sent on the chase while Raymond David Kallenberger, a 23-year-old Edgewood, Md. resident, allegedly hit up to 90 mph and tried to ram police twice, according to the York Daily Record. Kallenberger, wanted for carjacking and armed robbery in Maryland, crossed three jurisdictions and more than 20 miles throughout the joyride, which concluded with the stolen Plymouth Voyager in 8 feet of water in Goldsboro, Pa., police said. "It was a minivan floating down the river with a naked guy on it waving his underwear over his head," local resident and witness to the arrest Michael Shirk told the York Daily Record. The man was arrested after swimming to shore. He faces charges of aggravated assault, reckless endangerment, fleeing and eluding police, driving under the influence and possessing stolen property, according to the York Dispatch. After the arrest, Kallenberger was taken to York Hospital to have blood tested and treatment for hypothermia. He now awaits extradition to Maryland.